Beatrix is one of the few places I am willing to consistently travel out of my way for, even if it is just for a quick take away (the other being Messina Gelato). I have been a long standing fan of Nat’s delicious inventions snuggled in a fresh ciabatta roll, simply because they eat like a meal not just a simple baguette or sandwich. Also, her cakes are to DIE FOR. The biggest range is delivered with a smile on Saturday but each day’s delights are updated on facebook around 10am. The raspberry and strawberry meringue roulade is one of my favourite cakes at Beatrix, unfortunately it only comes round during Summer. A light, addictive cake which hits all the right spots. 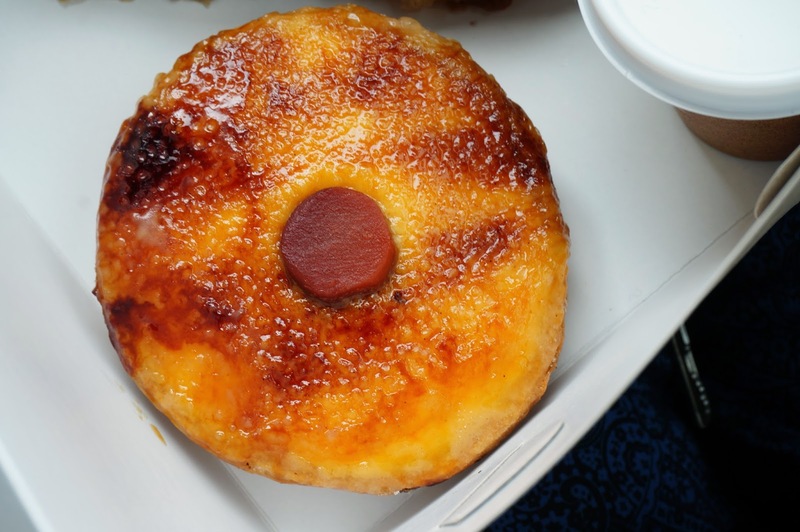 The Quince and vanilla Crème brûlée tart is a fantastic take on the traditional egg-y dessert. Made with organic eggs and vanilla bean, the crème custard is heavy but delicious. The only thing I would change is having a thicker caramelised top, to shatter and crunch through whilst enjoying the subtle quince taste. 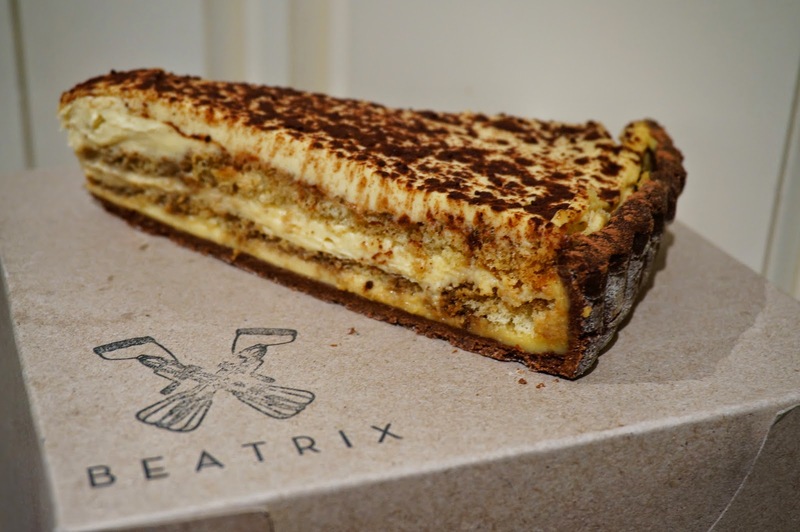 The tiramisu tart in cocoa cookie crust is a perfect balance of marscapone and coffee soaked cake layers. Some tiramisu I have tasted in the past either have too much moisture, sweetness or the coffee overpowers the dish, none of which occur here. Nat’s Tarte Tatin is always a hearty affair, thick with apples and pastry perfectly baked with caramelisation around the tops and edges; baked fresh and served warm with chantilly cream it is one of the best Tarte Tatin’s I have tasted but due to its irregular baking schedule I am constantly wanting more. 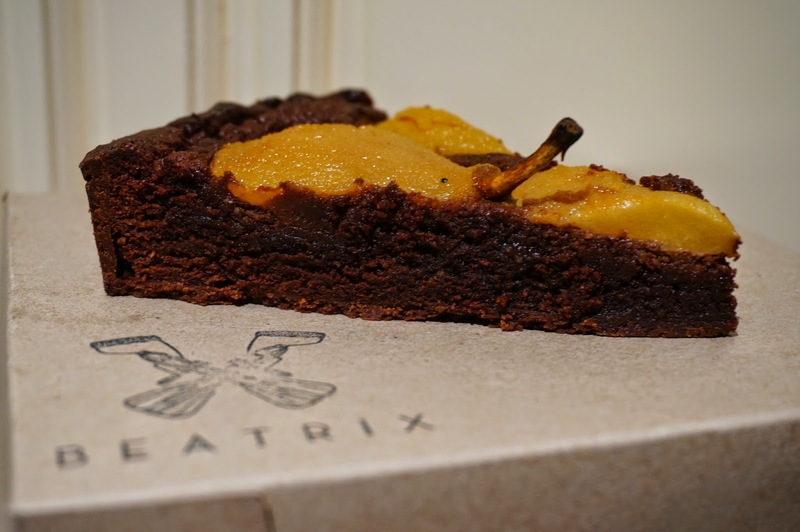 The Saffron poached doyenne pear and chocolate frangipane tart is an interesting combination of a crumbly chocolate base with sweet poached pears. It is quite fragrant and not as heavy as other chocolate cakes. 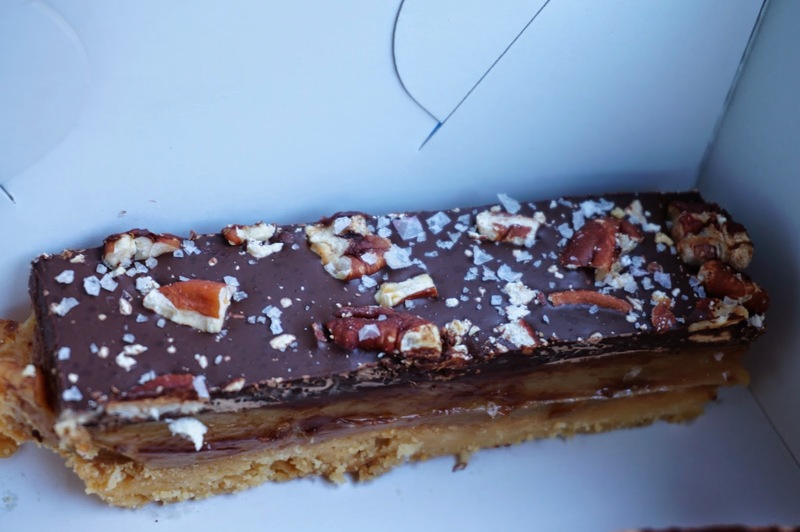 The salted caramel chocolate slice is decadence in a slice. Each layer is a perfect size, the caramel is smooth and luscious, the chocolate is dark but not too bitter and the base is crumbly like shortcake. Quite a regular on most days so you won’t have to worry about missing this one. Red Velvet Cake, a delicious moist lightly cocoa cake topped off with cream cheese frosting and tiny chocolate wafer balls. It looks impressive and tastes just as good. 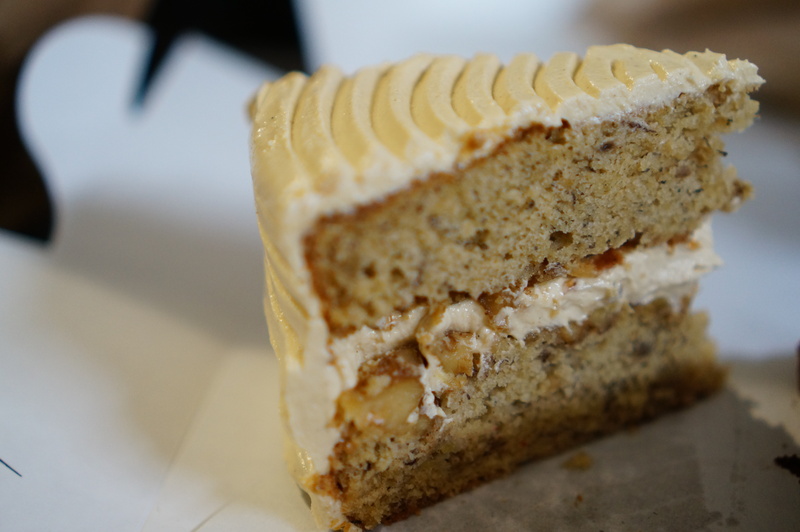 Banana walnut layer cake with halva buttercream is a nice subtle banana cake that isn’t too sweet or assaulting on the senses. Quite a nice afternoon tea cake, perfect to pair with a cup of English Breakfast. 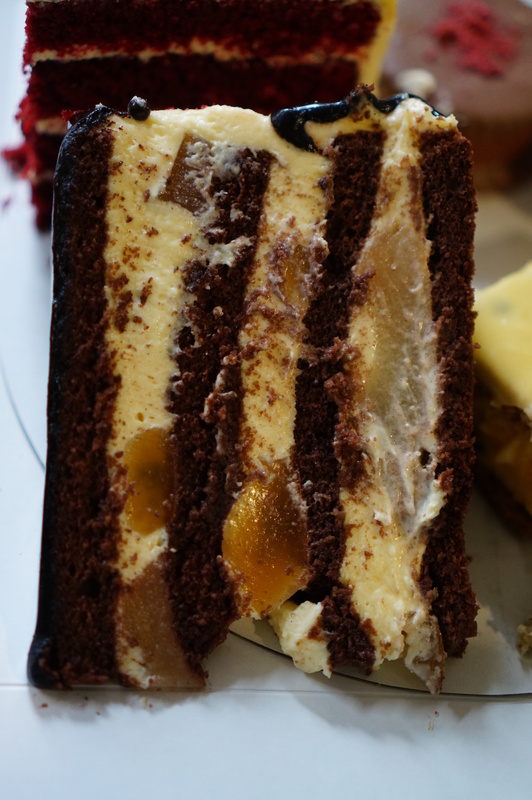 Helle’s Belle pear gateau with cocoa brown butter sponge, white chocolate mascarpone mousse, poached pears, pear jelly, pear liqueur and cocoa glaze. It really is as complex as cakes come. 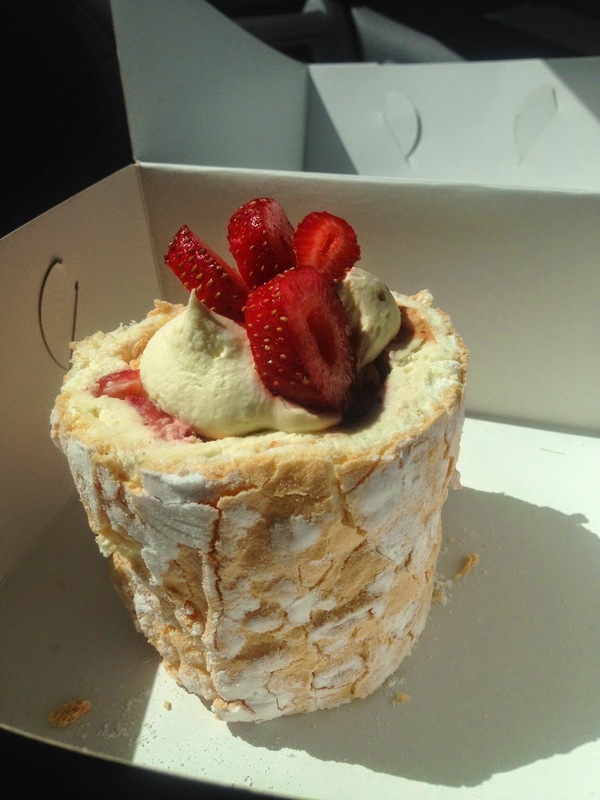 It’s a delicious romp through pear valley with a nice soft sponge and marscapone layers. It may look sloppy and borderline unpresentable, but wow. 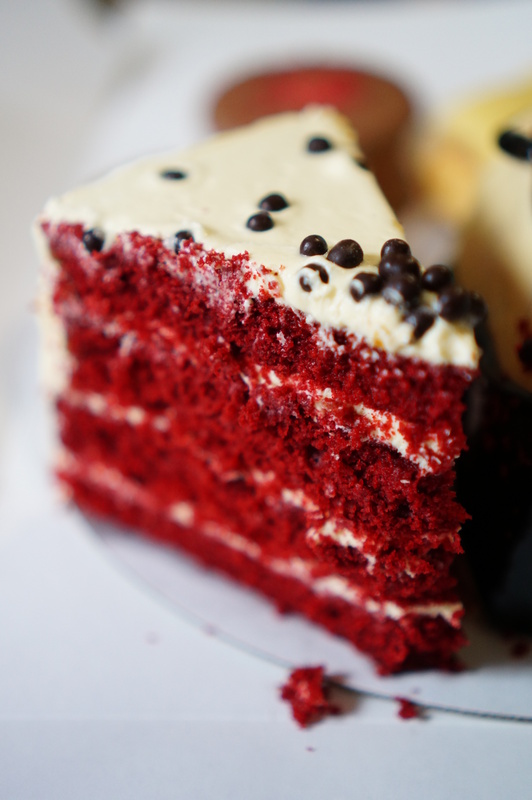 It does not go wrong with this cake. Calamity Janes! They’re most easily described like a Wagon Wheel but WOW does that not do it justice. 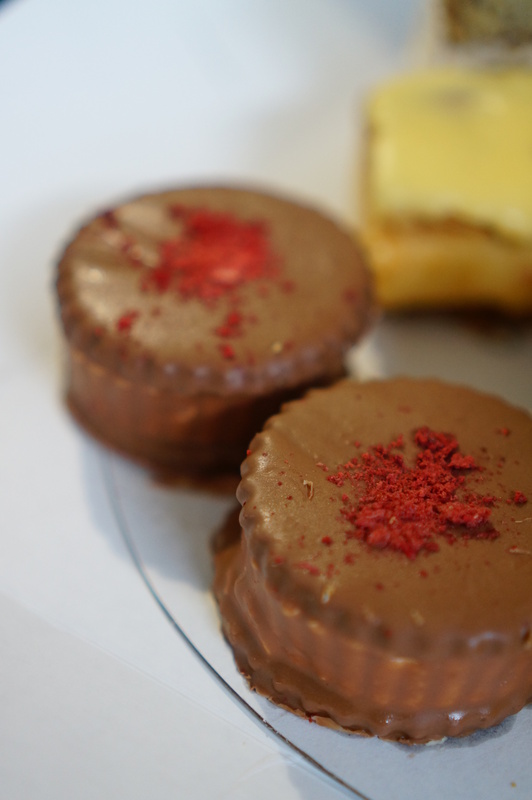 A homemade vanilla marshamallow round lathered in sweet raspberry jam smooshed between two sweet biscuits and coated in milk chocolate that melts in your hand. It’s kind of amazing. 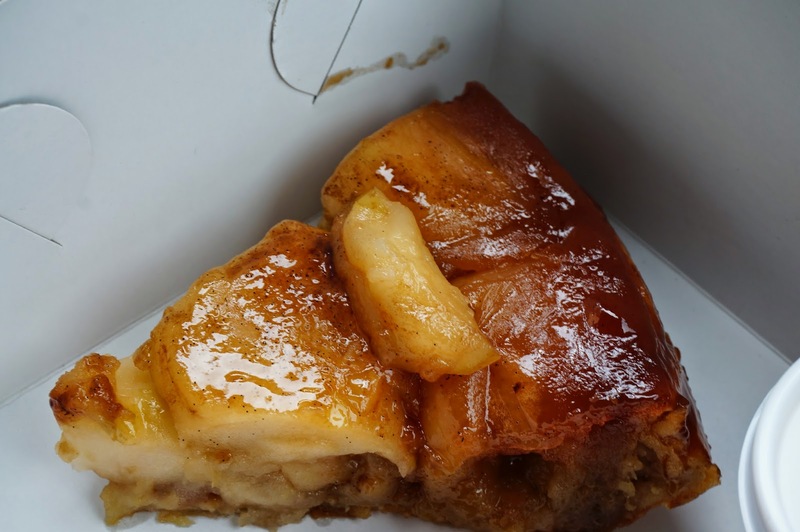 They are VERY sweet, but a very worthwhile treat to reward yourself with. 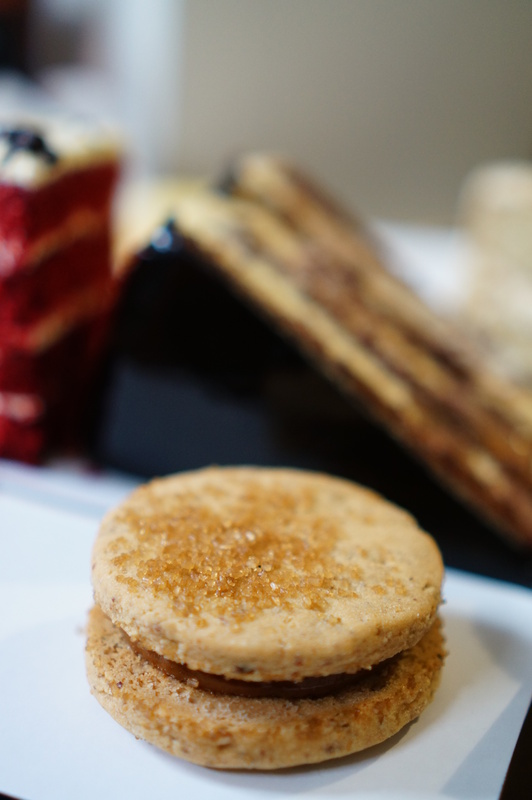 Almondjaws: toasted almond shortbread cookies filled with dulce de leches, quite a hard biscuit, and while the dulce de leche is sweet, overall this biscuit isn’t my favourite from Beatrix. 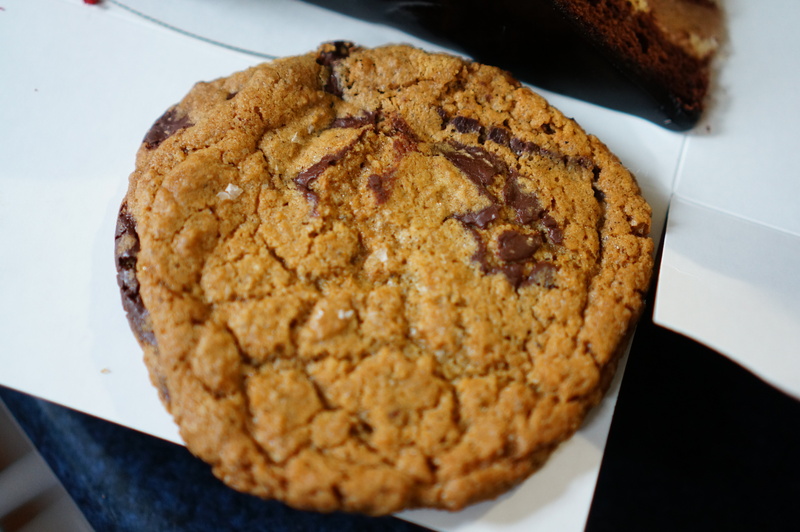 Dark chocolate chip cookies with a salty sprinkle – nicely gooey soft cookie with generous choc chips throughout. YAAAS. The Yotam Ottolambie; spiced and slow roasted Plains Paddock lamb, smoky eggplant/tomato/cucumber salad, herbs and toasted almonds. Yes, it really does taste as good as it sounds. Nat was inspired by chef Yotam Ottolenghi in this delicious concoction, and all I can say is how excited I would be if I were to be invited to Nat’s for a dinner party – she would represent. 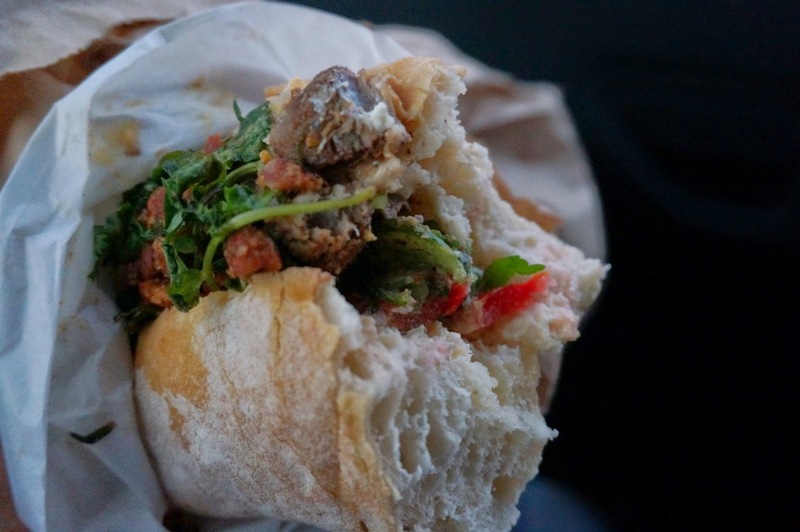 This ciabatta was so tasty, the lamb was juicy and tender, the salad rolled together with all the tastes of roast veggies at its best. The almonds gave a nice little crunch to each bite, adding texture to a dish that is so full of depth you wouldn’t believe it is presented in a roll rather than on a dinner plate in front of a fireplace in winter. 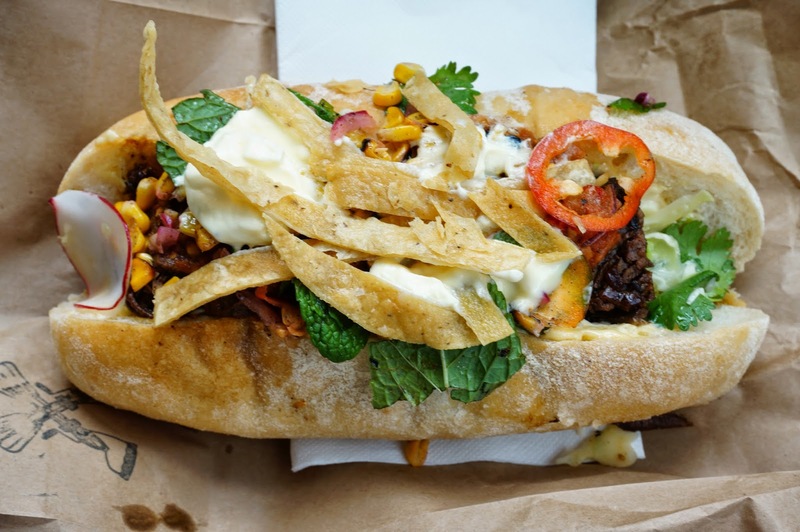 The Tuco; really slow cooked warialda belted galloway beef brisket, charred chilli salsa, corn, crema, radish and coriander slaw and crispy tortilla bits was like a Mexican fiesta in my mouth. I started off just tasting the corn and even that was so full of flavour, charred and popping sweet. Nat has considered every layer of this concoction. The beef has a delicious spicy kick to it and is so perfectly tender The salad furthers this dish into the realm of meal once again, with the tortilla chips finishing off the ciabatta. 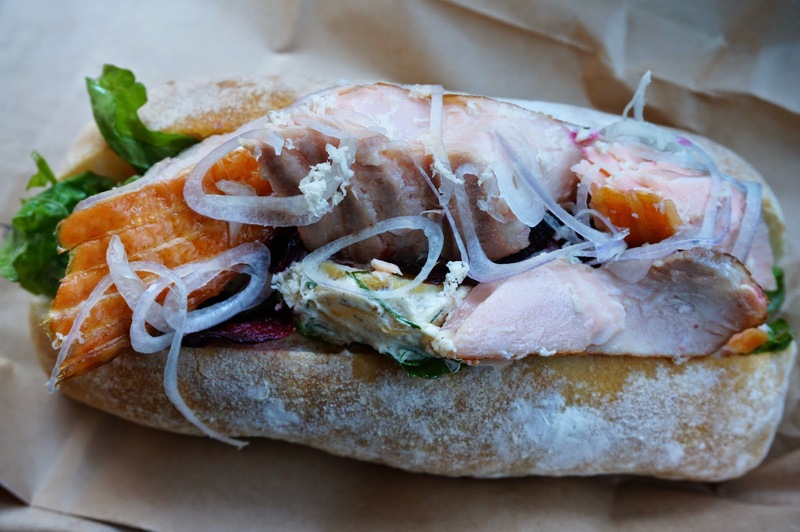 The Laika: Harris Smokehouse hot smoked salmon, fresh beetroot and dill slaw and Lightwood Organic’s desiree potato salad; is probably one of my favourite ciabattas from Beatrix. The combination of salmon and potato can’t be beat, except perhaps with the Lady Trout which is much like a Nicoise Salad in a ciabatta. The chunks of salmon are huge and satisfying and there is a perfect amount of potato salad mayo. So much win. The Babe: slow roasted pork shoulder, dill and pink lady apple slaw and crackling. One of my most favourite Ciabatta’s from Beatrix. 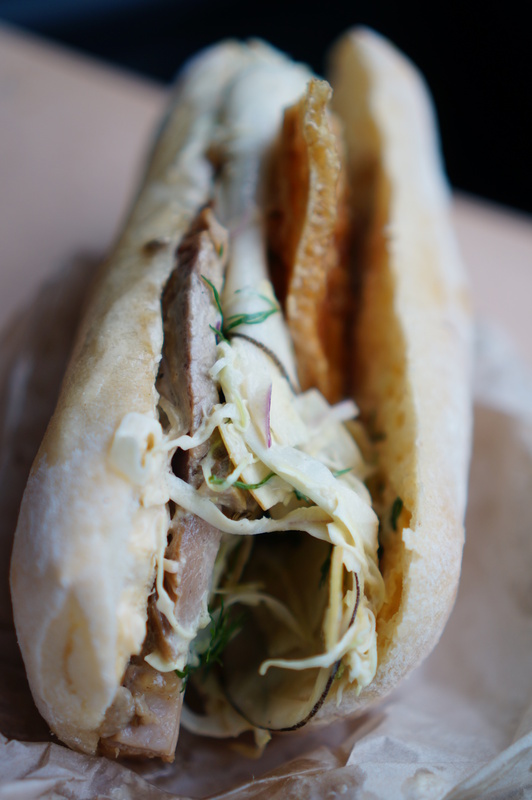 That juicy pork packed into the roll, coupled with oozy mayo slaw and topped off with crunchy crackling. It’s heaven in a bun. Always, always choose The Babe. Lady Trout: harris smokehouse hot smoked ocean trout with kipfler potato, green beans, egg, roasted tomato and parsley with black olive aoili. La Boef: cold roast beef, kipfler potato salad, beans, roasted tomato, roquette and tarragon mayonnaise. TL;DR Love me some Beatrix, the beginnings of my food adventures.